The new Women's Soccer Manager platform will make your soccer dreams come true. Become a manager of your favorite soccer club and use your knowledge and tactical skills to build a pro soccer career as a manager in Women's Soccer Manager. Choose your favorite club from one of the numerous women's soccer leagues around the world. Manage famous clubs like Barcelona, Arsenal or Lyon with authentic soccer players and recruit the most exciting stars to strengthen your team. Compete in the national pro soccer leagues, cup and Champions League and other famous leagues such as NWSL, USWNT, FA WSL, UEFA Women's Champions league and take your top eleven women's soccer players team to glory in this one of a kind - Women's Soccer Manager. 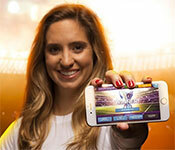 Click to start Women's Soccer Manager Free Download. Sign-up to get informed when the Women's Soccer Manager series has new game released with BD Studio Games' FREE bi-weekly newsletter.